Wreath on chair? I'm back to working on my living room. Only now, I have to work on Christmas touches as well. 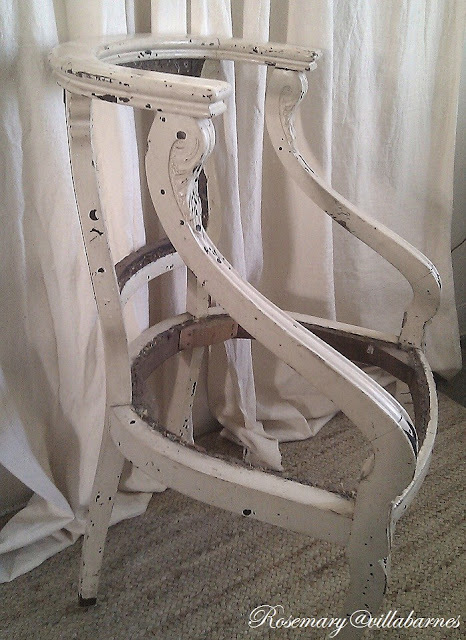 I have two of these vintage chair frames. Hubby picked them up at an estate sale for a VERY reasonable price, because, as you can see, ya can't sit on them. 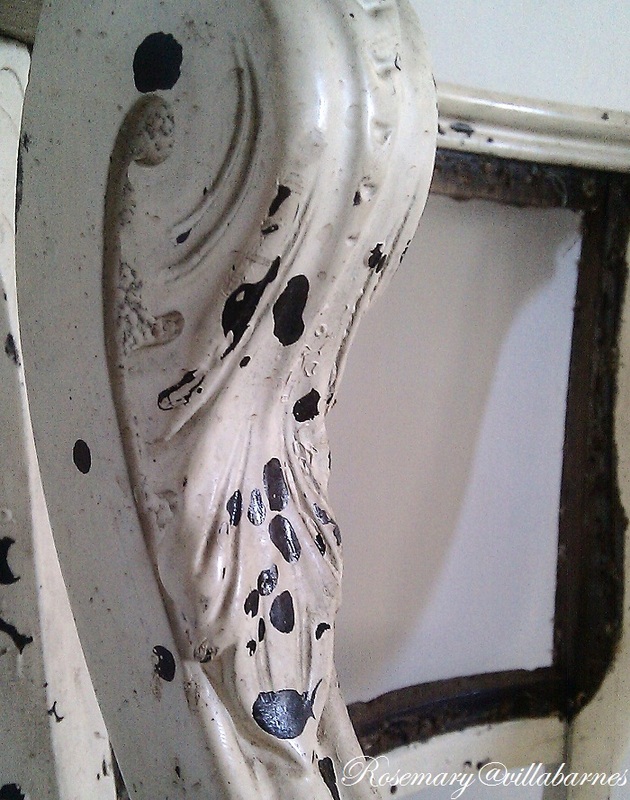 They have a great sculptural feel, and chippy old paint. At some point, I'll add a seat and back. For now, one of them makes a nice frame for my eucalyptus wreath. I stuck one of my gesso birdies in it. I'm going to put something on, or in the seat opening. Not sure what yet. I see some of you are all done with your Christmas decor. I need to get moving. I'm about to start decorating my tree, and break out my Nativity set. Formulating an idea for large angel wings. I'll let you know if it works out. Simple, but festive, is what I'm going for. Your chair frame is a real beauty. I love its "bones" and the wreath is a perfect touch until you get a seat in it. I would have grabbed that chair too! Love the detail and all the chipping paint.I know you will come up with a great solution for the seat! I love your chippy chair frame! Love the look of the wreath. It does symbolize Christmas really well. I would put that chair on display on a tabletop and call it a day! I love the simplicity of your wreath. I hope you don't mind me copying this idea. What a great chair frame. I can't wait to see how it looks with a seat! I don't know that I would put a seat or back in this beautiful frame. Love the lines. the chairs are art pieces especially with the adornments you added. Your chairs are fabulous, Rosemary. I have one similar with no seat. I set it next to our tree every year and put a large package across the empty seat and then I pile packages on it and under it, just leaving the beautiful carving to show. I just love the sculpting of the wood. Good luck with your decorating. I'm not done yet either. Those are great chairs, I love the chippy shabbiness, don't change a thing! Hummm, maybe some burlap seat cushions,...Fabulous! Your chair makes a great display for your wreath. Love those chippy white chairs and I'm sure when you are done with them they will be even more beautiful! Simplicity is my motto this year as well, but I' haven't even gotten my tree yet. I can't believe what people are posting with their whol house decorated already.....crazy!!! Great chair, Rosemary...and that wreath is beautiful! I'd love to see what you have planned! Can't wait to see those angel wings! I'm in love with your vintage chairs. So pretty! 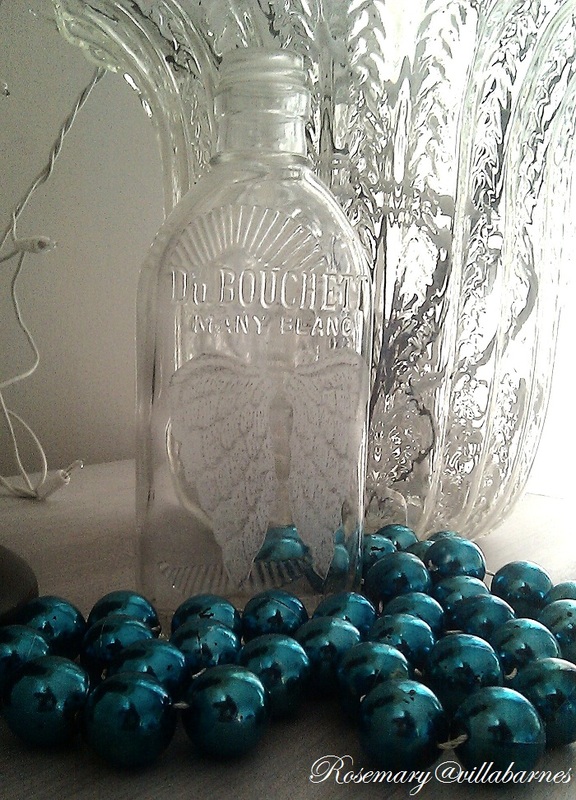 Your photo with the glass bottle and blue ornaments is priceless! Great chairs, Rosemary! I can just see how fantastic they will look done. Might as well incorporate them while they wait for their makeover. I think adding the wreath is a nice idea. You sure have an eye for detail!! Those chairs will look amazing when transformed. 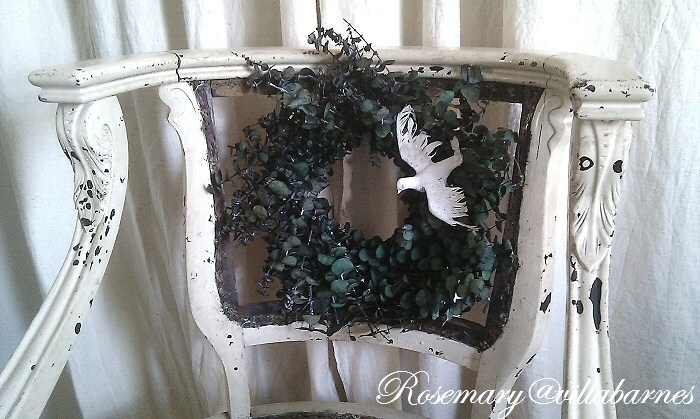 Rosemary your chair is a beauty and the wreath was the perfect touch! LOVE it!! You are such an inspiration. Love all that you do! You are so talented and creative. Have a nice restful holiday! Awesome! I adore those chairs (I'm on a chair hunt)! I think a bucket filled with something would be great in the seat. Can't wait to see what you come up with! I love the chair, I would have grabbed it too. Beautiful wreath. What a gorgeous chair (frame)! I like it in its current state--the lack of a seat means that the chair would accommodate my bulging bottom without the dreaded "spillover" effect! My goodness, Rosemary, don't say that you "stuck" one of your adorable gesso birdies in your wreath! I prefer this version: "I ever-so-carefully and thoughtfully tucked one of my gesso birdies within the aromatic branches of my eucalyptus wreath." Wish my husband would bring stuff home like that...those are gorgeous and so chippy! 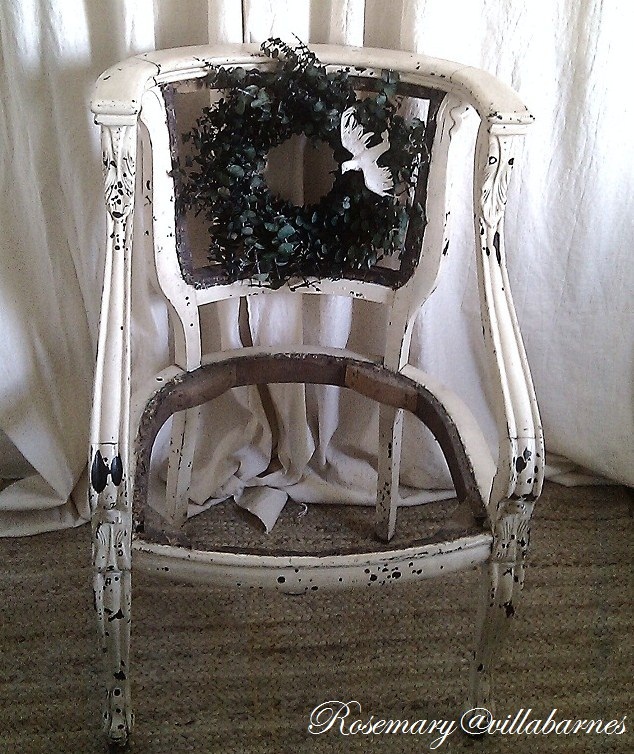 Love the wreath and that beautifully shaped chair! What a great looking chippy chair. the wreath is cute on it. Your chair is fabulous! Perfect with the wreath hung on the back. You've trained your hubby well to pick out such great finds. Hubby has a great eye too ~ love it! The chair frame is a swoon for me. Love your magical touch. Happy Holidays sweet friend. Wow!! Gorgeous. It looks great with all your recent decor too. Cheers. What a great pair of chairs! What a darlin' of a hubby to snag them for you!! And the wreath looks just delightful on it!! Love how you think, Rosemary!! Love that bird too! Thanks for partying at BWW! !